The Urban Community Ministry of the First Unitarian Universalist Church of Essex County has two sources. The first is the history and character of this church as a place where the gospel of universal love is preached and practiced. The second is my vision of what an urban congregation can be: a place where people of shared values live in solidarity with each other and in a larger solidarity with others in need and in struggle for justice. For me the gospel of Universal love is expressed as liberationist humanism. It is liberationist for the very fact that all persons are in need of liberation. The general idea of liberalism, as James Luther Adams told us, is a commitment to the liberation of persons from the bonds of arbitrariness, provincialism, and tyranny, so that they may be fulfilled as persons. Liberal religion does its work both in spiritual practice and in prophetic engagement with the world. Liberalism, however, is not a sufficiently strong path without the motive force of Love. Liberalism is not sufficient unto itself and it is prone to excessive and obsessive individualism. The force of love understood as solidarity is also necessary. Liberationist Humanism is committed to fighting all forms of oppression and to the fulfillment of persons. It is of necessity concerned with communities as well as with individuals. In terms of Unitarian Universalism as a religious tradition, liberationist humanism is more Universalist than Unitarian. In part because of its drift toward excessive individualism, Unitarianism has reached its limit. Reason, freedom and tolerance are important parts of culture and norms for society, but they are not a sufficient basis for a religious practice. The Universalist gospel of unlimited love is not yet exhausted. (Whether it ever will be or can be, I cannot judge.) The work of Clarence Russell Skinner opens possibilities that I seek to develop as liberationist humanism. Among the most important of Skinner's ideas is that the church must be rooted in the community. It must reflect the community. Largely white Unitarian Universalist churches in minority communities and affluent congregations in poor communities must change through growth. Those who make up such congregations -- whether in city or suburb -- are not evil people. But they are called by the gospel of universal love to break down the oppressive structures that divide them from their neighbors. The church is the place to do this. The most important social justice issue for Unitarian Universalism is not a policy or advocacy issue upon which we might take a stand -- although these are important -- it is whether we can have vital, community-based congregations in poor cities like Orange, New Jersey, as well as in affluent suburbs like neighboring and racially diverse Montclair or nearby and nearly all white Summit. Unitarianism and Universalism are two strains of liberal Protestantism derived from the left wing of the Reformation. Unitarianism emphasizes the use of reason, freedom from arbitrary constraints, and generous tolerance of belief and practice. Universalism emphasizes the unlimited Love of God or Love that is God. In the praxis at work in Orange, New Jersey, reason, freedom and tolerance are conditions under which the Love that is unlimited may be celebrated and practiced. Universal Love is still unfolding -- not because it is a self-existing or created ideal, but because it is recreated generation after generation and in the 20th and 21st centuries has taken the form of human solidarity. It has taken this form because it has been avowed and practiced by people of faith. The First Unitarian Universalist Church of Essex County was organized as the First Unitarian Church of Essex County in Orange in 1890. In 1967, this church absorbed a remnant of the Universalist Church of the Redeemer (founded in Newark in 1834 as the First Universalist Society of Newark). Ironically, the Universalist church died from illiberalism. It refused to integrate in the 1930s and drove out the minister who would lead it forward (Rev. Luke Hamilton Garner). In 1947 it left Newark for a suburban location on the border of East Orange (then a largely white city, now one of New Jersey's poorest cities) and Glen Ridge (then and now an all white and wealthy suburban town.) In 1967, it closed its doors. The Unitarian church from early in its history practiced the openness and loving welcome that embodies Universalism. As Norbert Čapek declared before leaving Orange in 1921, to establish the Unitarian Church in Prague, he came to the church in Orange expecting open minds but was surprised to find warm hearts as well. Beginning in the late 1950s, the church always had a small number of black members. It has a long history of community involvement. An open-heartedness remains a characteristic of the church's praxis to this day. In 1996, however, the church had shrunk to some 52 adult members (many elderly or at a distance) and two children. Little was happening except for Sunday services. Over the next five years, through the efforts of the minister and local members the church came back to life. The Urban Community Ministry began with Arts on Cleveland in the 2000-01 church year. New members increasingly were people of color. The minister made himself visible in the community and came to be recognized as a leader. 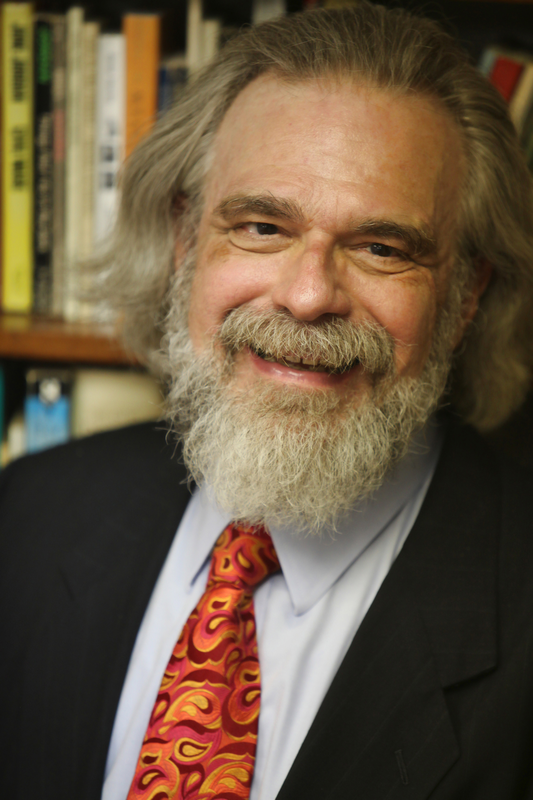 Lay people, such as Dr. Jessie Turk, took on leadership roles in the community. UCM activities have included ministerial involvement in coalitions, increased social action committee efforts in the city of Orange, and outreach programs to children in the elementary school adjacent to the church and to GLBT youth. The church reached the point where more than 20% of members were people of color (mostly African Americans) meaning that it was no longer a white church with a few black members, but a multiracial church. Adult voting membership reached 70 in June 2004 and RE enrollment reached 25 in September 2004. Praxis begins with where the people are, in this case, the church membership. In addition to morale building, I spent my first two years learning about church members, the church's history, and about the community. The City of Orange Township is a poor, majority-minority city that has experienced serious disinvestment and job loss, but unlike neighboring East Orange, has never quite collapsed as a city. A few members of the church live in the city, but most live in nearby cities and suburbs, including East Orange, West Orange, South Orange, Maplewood, Newark and Montclair. Most still do. The incomes of the members range from upper middle income to poor. Adult members include professionals, blue-collar workers, retired, and disabled persons. Orange is a city identified with failing schools. Evangelical churches provide youth programs. Two such churches rented space at First Unitarian Universalist of Essex. One, Faith Assembly of God, has an effective outreach to youth. In 1996 I noticed two things: one, the Unitarian Universalist building was associated with the effective youth work of FAoG and, two, neighborhood children were being inculcated with conservative religious values. I became determined that First Unitarian Universalist would reclaim identification of its building with liberal religion and it would develop programs to influence youth in a liberal direction. The membership included an artist, Elizabeth Seaton and soon after my arrival a jazz musician and his family joined (the first of several musicians and artists to join during my ministry.) Having seen the need for youth programming based on a liberal religious ethos and arts programs in Orange, I recruited Ms. Seaton, Louise Diaz, a program administrator at New Jersey City State University, and Jessie Turk, a retired college professor and co-founder of the United Vailsburg Services Organization in Newark, to help shape an outreach ministry. There were also poets in the congregation. Poetry and Pasta combined poetry readings and cheap eats. Arts on Cleveland taught art and liberal values to children in neighborhood schools. Rainbows on Cleveland was an outreach to GLBT teens was developed at the prompting of Carmen Pinto, an Afro-Cuban lesbian who had joined the church. Over the past four years, First Unitarian Universalist has become again the building identified with 35 Cleveland Street, and it reaches out to children and immigrant day laborers. Rainbows has faced the stereotype among black youth that churches are anti-gay and it has not been equally effective. Through coalitional work, the church has become a force in city issues. Pastoral and social justice ministries at First Unitarian Universalist of Essex address actual identified needs and build upon strengths already in the church. While there were many community needs to be addressed, the church faced those most pressing in the community (youth empowerment and education) with methods building upon strengths and skills already in the congregation: arts and education. I have developed my parish ministry in response to real needs. One result is that the church now has a part-time paid DRE. I had previously served as executive director of a community-based housing and social services organization in New York City and quickly developed contacts with HANDS, Inc. (a local nonprofit housing developer founded by local activists affiliated with the National Housing Institute) and other community organizations. I urged the congregation to join Jubilee Interfaith Organization (a Gamaliel affiliate) and Carmen Pinto and I were active in Orange Model City 2010, a short-lived coalition that nonetheless had a positive impact upon housing conditions and police-community relations in Orange. I put emphasis on OMC 2010 for a couple of years, but now have a renewed involvement in JIO that has expanded to include lay members of the church. Just as important as a basis in the realities of the church and the wider community, the Urban Community Ministry has been based upon an inclusive humanistic understanding of the gospel of love. This builds upon the church's long history of welcoming. While the church and the City of Orange have weathered many crises and dislocations from the Great Depression to the present, it has always welcomed and loved whoever came through the door. While denominational consultants brought in at times of crisis recommended selling the property and moving to a more demographically typical location for a Unitarian church, the congregation consciously chose to stay in the city. It should be noted that the populations deemed unsuitable for Unitarianism included -- at different times -- Italians, Negroes and factory workers. Yet the church managed to have these "undesirables" in its membership. There were blue-collar workers in the 1930s, African American members starting in the late 1950s, and out gays in the early 1970s. In the 1920s the church had welcomed the Čapeks a decade after the American Unitarian Association had ignored Norbert Čapek and Tomás Masaryk's request for support for a Unitarian mission to Czechoslovakia. An inclusive humanism truly welcomes all whatever a person's belief, race, ethnicity or other demographic characteristic. An inclusive humanism does not banish god-language. Nor does it use such language with disclaimers. What it does not do is make the promises or threats typically associated with more conservative religions. It does not reduce religion to the lowest common denominator. An Easter service is an Easter service, for example, not a spring festival. Yet traditions other than the Judeo-Christian traditions are seriously included. At First Unitarian Universalist of Essex, we do church. There are three hymns, a doxology, and prayer in every Sunday service. At least one hymn each Sunday is African-American. Call and response hymns are used whenever possible and there are several jazz services each year. Sometimes people get up out of the pews and dance. Worship is joyful, identifiable as worship, and lively. The people in the streets and the people in the pews are essential to the praxis of justice ministry. These are some of the people of First Unitarian Universalist of Essex. Among the church members are a disabled Vietnam era veteran, whose life is much better than it would have been had this church not existed in his community; a lesbian mother who felt more welcome here than in more affluent suburban churches; a middle aged couple who re-joined the church because of the need for a progressive community in these increasingly conservative times; a lesbian couple who are the adoptive parents of two brothers and the foster parents of a third child (one of the parents is also a union officer and a member of the Committee on Ministry); a married couple (both artists) who find First Unitarian Universalist more welcome to people of modest means than the Unitarian Universalist church in their home town; an octogenarian who attended for 50 years before signing the membership book in 2004 with these words, ”this church is finally really integrated”; a school nurse and a banker who teach English classes for Latino day laborers, every Sunday after church. 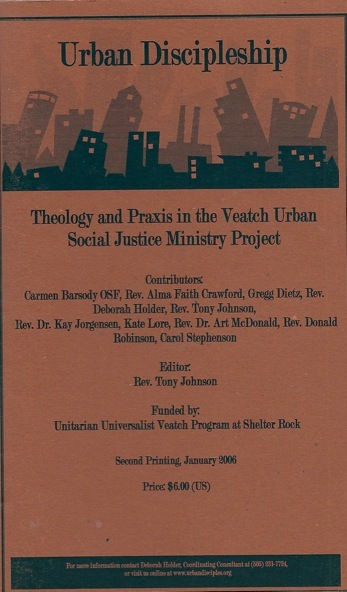 Among the community members who are also essential to the praxis of justice ministry are a high school student whose internship in Arts on Cleveland helped him decide to pick a college where he could train to be a teacher as well as play football; a high school student whose immigration status precluded employment, so she volunteered in AoC; the dozen or so day laborers who gather for English classes every week; the students at Central Elementary School for whom Arts on Cleveland exists; the music teacher at Central whose students sang in a Sunday service; two men who fled the Sudan and who finally received refugee status because of church members’ efforts; the artist who brings her talent and Unitarian Universalist values to neighborhood children; the homeless man who found acceptance among Unitarian Universalists; the Orange High School administrator who has helped us build bridges with the community. Some of these people are white; some are people of color. Some are very affluent; some are working class; some are poor. So far I have discussed oppression and the practice of liberationist humanism, but with a very general discussion of oppression. My faith stance (theology) is one that has a very positive base in the oneness/goodness of the world and of humanity. But there is evil in the world and we must and do confront it in our church's ministry. Since I hold to no notion of immortality, I cannot say that there is a personal salvation beyond this life. Nor do I hold to a millennial notion of collective salvation. With Sharon Welch, I hold that social justice ministry works in the city to build a better reality and I recognize that what I create may be lost or (better) superseded in the future. But that is beyond my responsibility and knowing. I will strive to build what will last -- ministry is institutional -- but I am in no way convinced that I am building the kingdom of heaven. Welch wrote in Communities of Solidarity and Resistance, that sin is the denial of solidarity. I have made this my working definition of sin. Therefore, solidarity is the practical goal of justice ministry, as well as its praxis. Through solidarity, oppression may be broken and individuals liberated, but the original sin -- if you will -- is the denial of our connectedness as human beings. In enslaving, exploiting, killing, discriminating against another, the "sinful" actor is denying the humanity of the other and breaking the solidarity between them. Racist and oppressive structures contribute to this breaking. Such structures may or may not have been consciously constructed, but in either case have the same effect and -- just as bad -- involve people who want to be good in sinful behavior, even as they are themselves oppressed by these structures. That many Unitarian Universalists are blind to the reality of class in the United States and to their places and the meaning of their places in the class system does not mean that they are themselves evil. What it does mean is that to the extent that they do not break through their false consciousness, they are involved in the structural sin of the U.S. class structure (mirrored within the denomination) that is actually the force behind our national institutional racism (also mirrored within the denomination). Solidarity begins with honesty and real consciousness.